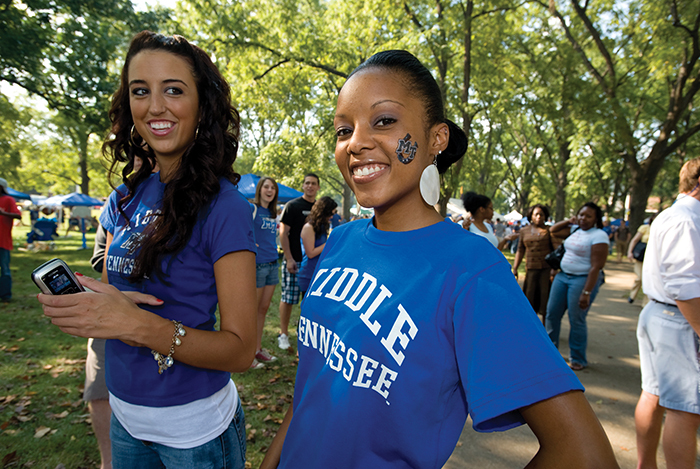 MTSU’s Quest for Student Success is aimed at ensuring that every student who comes to MTSU with the drive to achieve will get the best instruction from excellent professors and the best guidance from engaged academic advisors who care deeply about academic success. New data proves that the Quest is paying off. 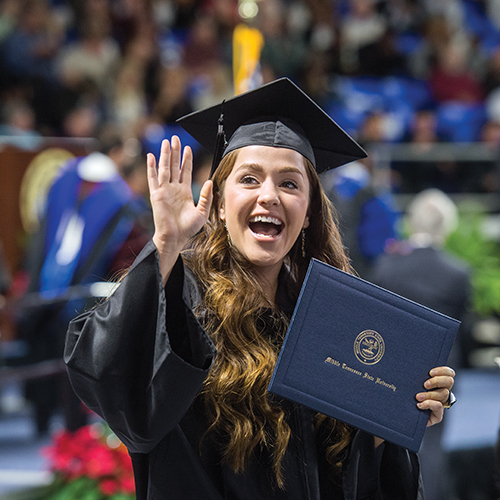 MTSU achieved increases in persistence between fall 2014 and spring 2015 semesters with not just new freshmen but all students, undergraduate and graduate. For all colleges, persistence rates are at their highest level in five years. Football activities at the MTSU vs Troy game. 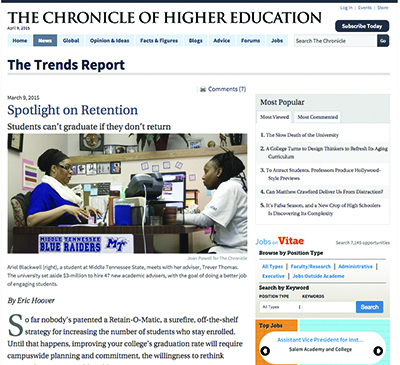 MTSU’s Quest for Student Success was the subject of an article published in the Chronicle of Higher Education March 9, 2015. MTSU’s student success efforts (specifically its use of data to identify strugling students) were also cited by the Washington Post in June 2015. Developing a retention program was the right thing to do for both incoming and existing students. Research shows that the first two years are critical to a university student. A bump in the road, especially at the beginning, can derail the progress of those struggling to stay enrolled. The Quest complements and reinforces the Complete College Act passed by the Tennessee General Assembly in 2010, which ties higher education funding to retention and graduation as opposed to enrollment, and Gov. Bill Haslam’s Drive to 55 initiative, which seeks to increase the percentage of Tennesseans with postsecondary degrees or certificates to 55 percent. Even in a time of reduced state budgets for higher education, MTSU made a major investment in student success by reallocating $3 million to hire 47 new academic advisors (more than doubling the previous number). These additional advisors offer students support, guidance, and encouragement to stay on track and graduate on time. A new program called REBOUND targeted 564 fall 2014 freshmen who earned less than a 2.0 GPA in their first semester and offered special-ized advising and activities. Traditionally, only about 20 percent of these students would return for the fall 2015 semester. Early indicators are positive for persistence rates with this group. In fall 2014, free tutoring was offered for more than 140 classes; in spring 2015 free tutoring support was provided for more than 120 classes. The University’s new Finish-Line Scholarship returns tuition increases incurred during a student’s college career if she or he graduates in four years. By the end of summer 2015, a total of 20 undergraduate courses will have been redesigned by faculty, resulting in increased faculty and student engagement, collaboration, and satisfaction. Student success rates have increased markedly in these redesigned courses. A sophisticated new software package the University adopted makes proactive advising a lot easier. College advisors are able to reach out to students who might be having trouble academically as identified through instructors’ alerts or the predictive analytics functions of the software. MTSU has expanded eligibility for five major scholarships.